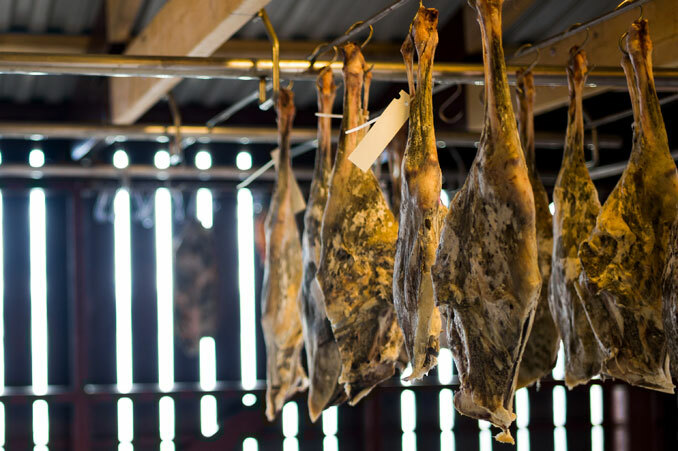 Preserving food has always been an issue for mankind and one of the earliest methods that is still in use today is air drying; the gradual dehydration of cuts of meat at a uniform rate. One imagines that this was initially an accidental discovery by our prehistoric ancestors, perhaps a result of observing naturally occurring preservation in the carcasses of scavenged animals in conditions of high heat and low humidity. However it was discovered, the process was an important one for the preservation of meat prior to refrigeration and continues to be of value today as the means of producing a variety of cured meats, many considered to be specialities. One such dried meat that is unique to the Faroe Islands is Skerpikjøt, mutton that has been air cured and fermented for several months producing a distinct strongly flavoured, and scented, product. Other than in Denmark, where it can be obtained through Faeroese associations, skerpikjøt is only found for sale on the Faroes. 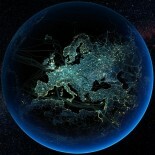 European Union, and other national or trade association food standards and import regimes mean that its import into these regions is currently restricted. As it is effectively rotting meat that remains fit for human consumption this is perhaps not surprising. Curing takes place in the hjallur, a purpose built outhouse that allows for wind air flow to aid the drying of the meat. 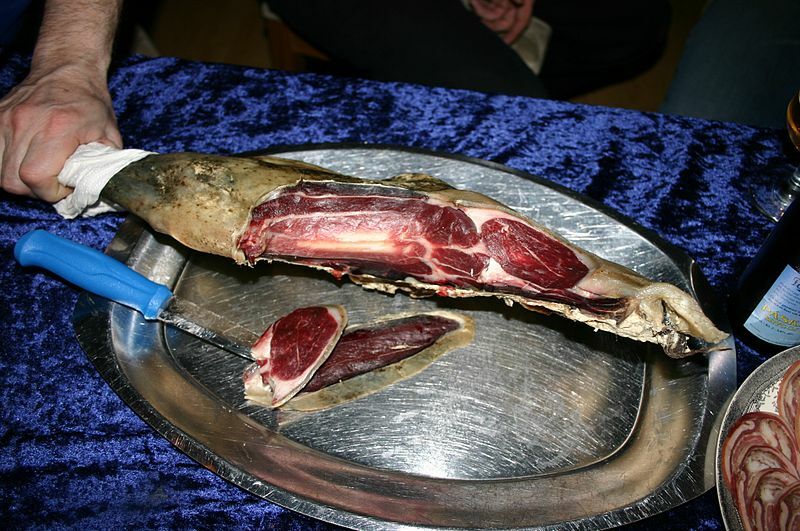 Skerpikjøt is described as being skarpræstur, meat that has been wind cured and fermented for a long period of time, typically 5 to 9 months, or up to a year if conditions are particularly humid.. Before it becomes Skerpikjøt the mutton goes through two other stages, visnaður and ræstur, which describe the rate of curing and fermentation and are important in determining the final flavour of the Skerpikjøt Fluctuations in temperature and humidity at any phase can alter the taste of the meat by encouraging or inhibiting the process. Visnaður, literally ‘wilting’ in Faroese occurs after a few days and refers to the earliest stages of decomposition and drying. If it is eaten at all, it must be cooked. Raestur, depends heavily on humidity and temperature. Curing has advanced to a stage where it may be eaten raw but is more likely to be served cooked. The third and final step in the maturation cycle of Skerpikjøt is turrur, which means “dry.” Turrur is achieved when enough water has evaporated and the meat has become firm, like a saltless charcuterie. The flavour is described as being milder than raestur and it is commonly eaten raw in thin slices on bread. I haven’t eaten Skerpikjøt myself and based on the descriptions of those who have, I’m not sure I could bring myself to do so. By all accounts the smell is one of decay and to non-Faroese sensibilities produces an instinctive revulsion in much the same way as we would react to milk that has gone off, or indeed rancid meat. I imagine however that if one can get over the smell the meat would be palatable. Don’t know if I’m brave enough to try that! I think that I would try it once just to see what it’s like. After all, as a child I thought that red wine was the foulest smelling and tasting substance known to man. Now I’m rather partial to it. This entry was posted on November 21, 2015 by aaroncripps in Countries and Regions, Faroe Islands, Food and Drink, Recipes and tagged Faroe Islands, Faroese Recipes, Food, Recipes, Skerpikjøt.